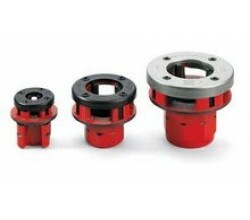 Rothenberger P/N 5.6381 HSS Dies To Suit Ridgid Heads No.504A,811A,815A,856,911 & 913..
Rothenberger P/N 5.6380 HSS Dies To Suit Ridgid Head No.504A,811A,815A,856,911 & 913..
Ridgid P/N 18951 Alloy Dies To Suit Head No.504A,811A,815A,856,911 & 913..
Ridgid P/N 57082 Ultra Hard Titanium Coating HSS Dies For High Performance Threading. To Suit Head ..
Amigo E - Lightest, strongest & fastest up to 1" Electric die stock with quick change die heads. F..
Rothenberger P/N 7.1272 1/4" - 2" Capacity.. Powerful super handy electric tools for threading with unique support bracket. Ready to use anywhere..
Rems eva - the plumbers die stock Excellent start cutting and threading. Steel ratchet lever, thick..
Ratchet Handle 1/4" - 1 1/4"
Ratchet Threader Set Supercut 1/2 - 1"
Rothenberger GB Pipe Threader Kit Contains 1x1/2" , 3/4" & 1" BSPT Dies 1 x Ratchet Handle 1 x Ca..